About 30 people were killed and more than 50 injured in a car blast outside a police college in Yemen's capital Sanaa, police say. The victims of the attack are mostly college students and people who came to enroll with the police, witnesses and law enforcers say. They add the blast was heard across the city and a plume of smoke could be seen from a distance. "What happened is we were all gathering and ... (the bomber) exploded right next to all of the police college classmates," eyewitness Jamil al-Khaleedi told AP. "It went off among all of them, and they flew through the air." Photographs of the aftermath of the blast have quickly been posted on social media. They show the burning wreckage of the vehicle, another car burning and bloodied bodies lying on the pavement. A car was passing when the bomb went off and was set on fire along with everyone inside, according to police. "The situation is catastrophic. We arrived to find bodies piled on top of each other," a paramedic at the scene told Reuters as ambulances took casualties away. "We found the top part of one person screaming, while his bottom half was completely severed." The Interior Ministry said it was suspending enrollment at the police college. Yemen has seen an increase in instability since the 2011 popular uprising that ousted President Ali Abdullah Saleh. Al Qaeda in the Arabian Peninsula (AQAP) has been increasingly active, staging a growing number of terror attacks. Neighboring nations are fearing of AQAP gaining enough power to carry out attacks outside Yemen. 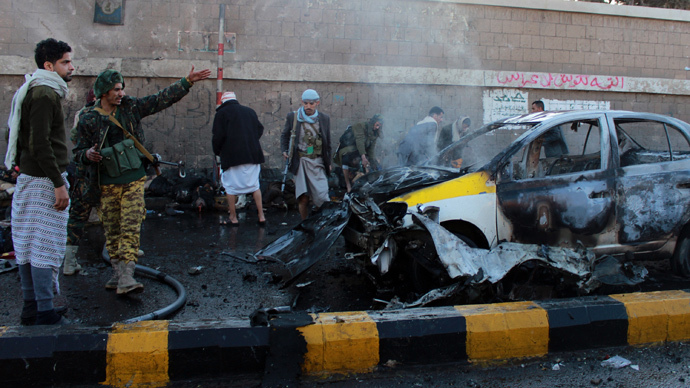 At least 33 people were killed in a suicide attack near a cultural center in southwest Yemen a week ago. The attack targeted the Houthi Shiite Muslim militias, who have managed to drive AQAP from many areas they used to control. In November, the AQAP military chief vowed to carry out fierce attacks against Houthi rebels.